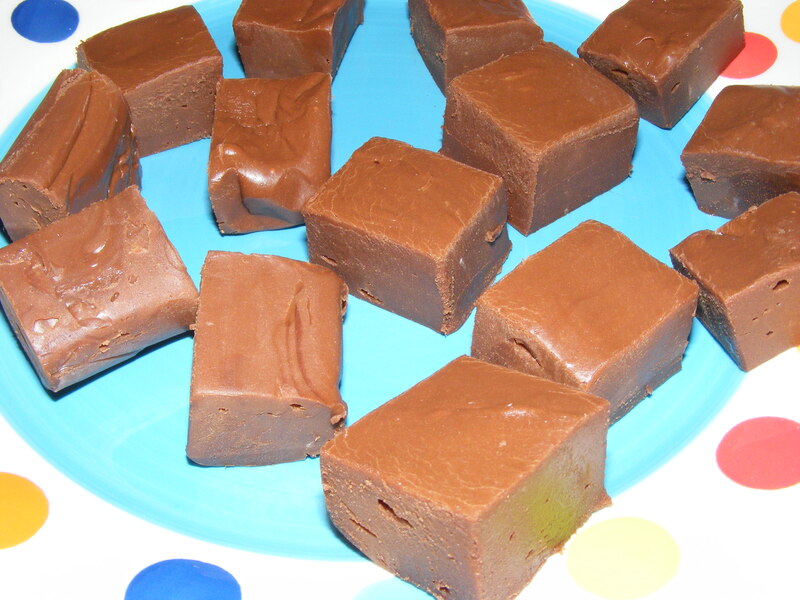 This is possibly the easiest fudge that I have ever made! My great-aunt, Ollie, was the family fudge-maker and her recipe was closely guarded secret. I inherited all her cook books and with that her highly prized chocolate fudge recipe. Her recipe used evaporated milk, a whole bag of granulated sugar and several hours of beating the fudge into submission! Yes, Ollie’s fudge was lovely, if a little sweet for my palate, but to be honest I just do not have the time or the energy to make it these days. It is, however, my grandmother’s favourite sweet. When I stumbles upon this recipe in the “Good To Know” magazine I thought it was worth a try. It only have four ingredients so if it didn’t work I wouldn’t have wasted too much money. I have to say it really is a doddle! My tip would be to pour the mixture into your Kenwood mixer or food processor and let the machine do the tiny bit of mixing for you. It will save you lots of energy and prevent you burning yourself in the process. I used a mixture of milk and dark chocolate but you could just as easily use all dark or all milk. Cut it up, pop it in a fancy box with a bit of tissue paper and “Hey, Presto!” you have a beautiful gift for someone! How easy is that! Put the chocolate, milk and butter into a heavy bottomed saucepan and heat gently until melted. Pour into a lined 8 inch square tin. Chill in the fridge for 1 hour until set then cut into pieces. I found a pizza cutter worked brilliantly for this.